Jio Prime has Acquired 72 Million Subscribers Already & Counting. Hello guys, Today I am here to say congratulations to all Jio Lovers as Jio Prime has acquired 72 million customers already and to see the tremendous response, Jio is extending last date for Jio prime recharge to 15th April. Its really a good news for all Jio subscribers as more people are loving Jio services and conversion rate from Free to Paid service is record breaking. Jio made many records so far, e,g Fastest 100 million and most data consumption per subscriber and now rate of conversion from free to paid services. Recently, there was some rumors on social media platforms that only 12 million customers has opted for Jio Prime membership, so the official data is now out from Jio Headquarter that 72 Million subscribers has enrolled so far for Jio prime membership. 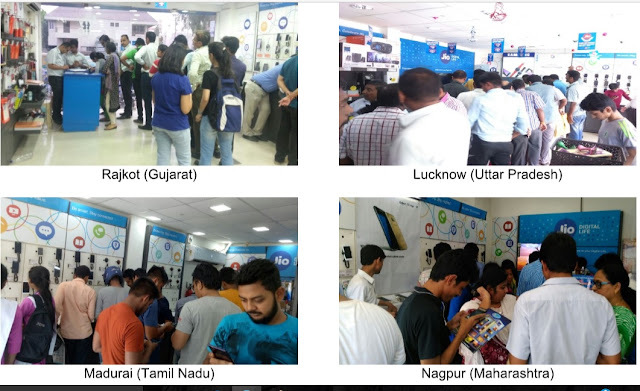 Check out some pictures of Jio stores in different cities. People are still coming to get Jio Prime membership. Now after getting tremendous response from customers, Jio is now happy to extend last date of Jio Prime offer to 15th April. So, if you missed this offer by any case you can now enroll for Jio prime till 15th April. This tremendous response by Jio customers are slapping those who were saying that People are ready to throw Jio SIM after expiry of Free Services. On the top, Jio is giving complementary offer to all Prime customers in which people will be getting 3 months of free services instead of 1 Month. So, you just need to be a Jio Prime member and then need to do a recharge of Rs 303 or higher to get free services for 3 months. Also note that the paid tariff plan of rs 303 and higher will be applied only on July after expiry of free services. So, in just 303 Rs recharge you are getting 3+1 month of free services, this is best complementary offer a telecom operator is giving to their lovely and loyal customers. So, what are you waiting for? go and get your Jio prime recharge done before last date and do not forget to pay using Jio money to get 50Rs cashback. Jio is now world's largest greenfield LTE 4G Wireless broadband network and now they are ready to make it more bigger and better by doing more Investment in it. Jio is now ready to add 100,000 more towers in India at a huge investment of 200,000 Crore Indian Rupees, which is also largest investment in the world. This investment will expand Jio services in each and every part of India. Mobile Number Portability is already available on Jio and lakhs of people has already ported their numbers to Jio. So, what are you waiting for? come and join word's biggest customer friendly Telecom Network and also enjoy special benefits. Finally, Jio International roaming is fully available, so if you are International traveler then you can enjoy Jio data and calls at best rate in the industry. Jio is world's fastest growing 4G network provider and still trying to make it more stronger by doing regular investment in their network. The Installation of 100,000 more towers shows that they are always ready to make their services batter before getting complaints. Jio is only network provider who is giving free services for about 1 year. Jio plans are your pocket friendly and far better than other operators. Also Jio is now giving 3 months extra free services if you are a Jio Prime member and doing recharge of Rs 303 and above. So basically it is giving you 4 months of Jio services at just Rs 303. There is no reason to think about this offer, just go and get it before last date.